Discover Montserrat does not set schedules or handle bookings. We share the schedule for information purposes only. If you require other information please message the Access Division Page on Facebook or contact them on the ferry.ms website. Both Fly Montserrat and SVG Air will be operating regular flight services throughout the weekend. All Customer are asked to take note and plan their travel accordingly. The ferry service between Port Little Bay in Montserrat and Heritage Quay Pier in Antigua operates five days a week. No advance ticketing is required, as travelers can purchase their tickets upon check-in. However, to facilitate ticketing, check-in and other clearances at the point of sale at the ports, passengers are asked to check-in 90 minutes in advance before the scheduled time for departure. 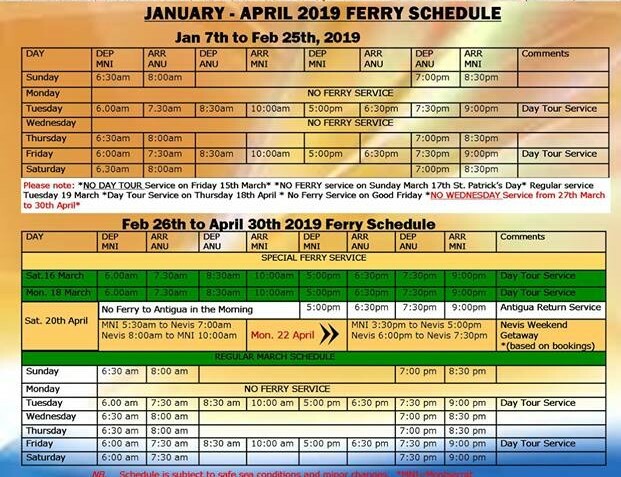 The fares for the ferry service are EC$300 return (EC$150 one way) for adults, EC$150 return for children between 2 and 12 years and EC$50 return for infants below 2 years. Each passenger is allowed 2 pieces of baggage free and any additional baggage is charged at EC$50.00 per piece.